Did you know development programs that rely solely on transactional giving, like direct mail and special events, generally have a return of investment (ROI) of about 200 percent, while programs that are relationship-based and major gift focused can enjoy a much higher ROI of 500 percent or more? That’s why it’s so important to have a diversified development program with a strong and systemized major and planned gifts component. Now is a good time to evaluate your major gift practices to make certain that you are being as effective as possible when you, your volunteers, development staff, and CEO are cultivating major gift prospects. Though this blog focuses on major gifts, it is important to remember to approach conversations with donors and prospects holistically – integrating annual, planned, and major gifts into the discussions when appropriate based on the donors’ needs. Johnson, Grossnickle and Associates recently hosted “Essential Elements of a Successful Major Gift Program,” a free webinar to review and share best practices in major gift fundraising. I encourage you to watch a recording of the webinar, which includes a thorough and integrated five-point checklist to help you make sure your major gift program is primed for success. Identify prospects to be included in prospect management. Prospect assignments for organizational leadership and development staff should include a balanced pipeline of major gift prospects in cultivation, solicitation, and stewardship. A list should be compiled based on previous giving levels, recommendations from staff and board members, and additional research conducted by the staff. Prospects who should be assigned for contact management include those who are anticipated to have the capacity and inclination to make a major gift to the organization. 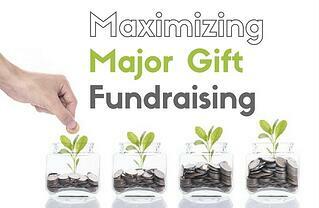 What constitutes a major gift depends on the size of the organization, its operating budget, and its donor base. For some organizations, a major gift may be $10,000; for others, $100,000 or more. Assign identified prospects to specific staff members. After the list has been complied, development staff leadership should review the list and begin determining who has the best relationship with the prospective donor and can engage the prospect in a strategic and meaningful way. Commit to personal visits with donors and prospective major donors. Organizational leadership and development staff must set aside time for personal visits as a top priority. Engaging major gift donors will require multiple visits, increased overall correspondence, and a focused effort - and will require the organization’s leadership, including board members and staff, to engage donors and prospects in new ways. A full-time development officer who has no additional responsibilities other than cultivating major donors should be expected to complete 125 personal visits with donors and prospects on the cultivation continuum per year, or the equivalent of two to three visits weekly. Some of these personal visits will likely involve cultivating the same prospect more than once. Meet on a regular basis to review current portfolios and activities. The development staff should meet frequently, perhaps every other week, to review recent activities and plan out next steps. These regular meetings for reporting and strategizing help to create urgency and hold everyone accountable for their assignments and results. Integrating these strategies into a major gift program will ensure that you are maximizing the gift potential of your current major gift prospects and also help to identify and qualify future donors. This systemized approach forces you to have a strategy in place for each donor’s future trajectory with your organization.